We've done a lot of research on wealth management. Unfortunately, a lot of wealth managers out there became wealth managers by simply changing the title on their business card. We think there is more to it. In AFG's Private Client Group, we believe that successful wealth management has a foundation based upon advanced planning, investment consulting, and relationship management. 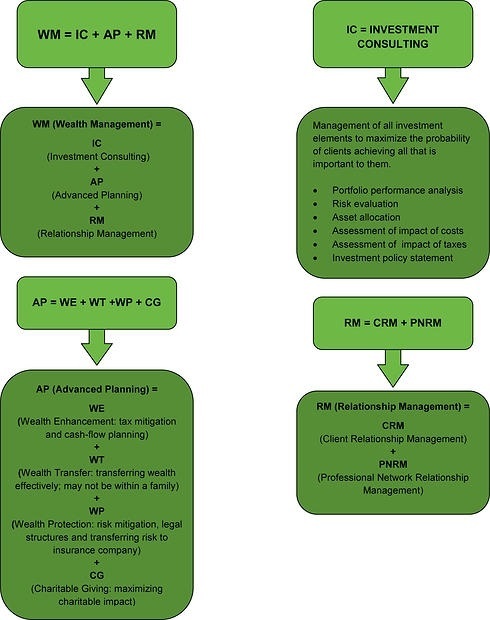 We don't think there should be any ambiguity regarding what you should expect from your wealth manager, which is why we created this wealth management model. We realize our model may not be right for everyone, but our clients do tell us they have never experienced anything like the relationship they have with our firm. If you're not sure if you are ready for this type of wealth management relationship, please call. We're happy to have a brief conversation with you to determine if there is potential value in beginning a relationship with AFG's Private Client Group. We'll make you a promise. If we're not a perfect fit, we will be the first to tell you. We'll also be happy to offer an introduction to another firm that may better suit your needs if we feel we are not the right fit.